One of Leonard Maltin's 151 Best Movies You've Never Seen gets a high-definition release in March. 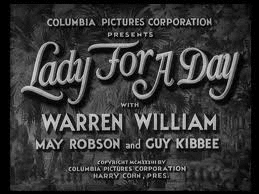 In an early announcement to retailers, Inception Media Group has revealed that 'Lady for a Day' will have a Blu-ray on March 20. The 1933 comedy/drama directed by Frank Capra ('It's a Wonderful Life') is based on the short story by Damon Runyon and was nominated for four Oscars including Best Picture, Best Director, Best Screenplay, and Best Actress. Specs haven't been revealed yet, but supplements will be introduction and commentary by Frank Capra Jr. as well as a new essay by film critic and historian Scott Eyman. You can find the latest specs for 'Lady for a Day' linked from our Blu-ray Release Schedule, where it's indexed under March 20.